Today’s choice has been a long-time #1 favorite in the US. 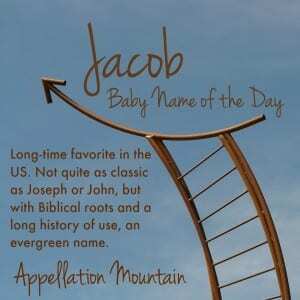 Top Fifteen week continues with Jacob as our Baby Name of the Day. In Greek, he was Iakobos, and in Latin, Iacobus. James also comes from the same roots. And it’s a BIG name in the Old Testament. 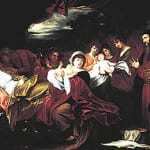 The meaning is usually given as supplanter, since Jacob was the younger twin, but managed to inherit their father’s birthright instead of his older brother, Esau. Jacob is the son of Isaac and Rebecca. His twelve sons founded the twelve tribes of Israel. He appears in the Talmud and the Qu’ran as well. Jacob’s vision of a ladder leading to heaven is an important spiritual concept through the ages. Through the Middle Ages, James was a name for Christians, and Jacob a name for Jews – at least in English. That changed after the Reformation, and there are plenty of familiar Jacobs pre-twentieth century, from one of the fairytale-gathering Grimm brothers to Scrooge’s former partner in A Christmas Carol. It was especially big in New York, thanks to the name’s popularity with Dutch settlers. Through the early years of the twentieth century, Jacob was a Top 100 pick. 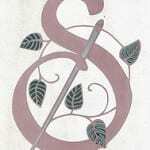 It was a double name, too – think of John Jacob Astor, or John Jacob Jingleheimer Schmidt. In the early years of the 1900s, declaring that everything was “jake” meant that everything was just fine. By the 1940s and 50s, Jacob had fallen into the 300s, and remained obscure for a few decades. There’s no single event that explains the name’s revival. Jake is just as friendly as Joe and Jack, and Jacob is just as wearable as Joseph or John. But Joseph and John remained evergreen classics, while Jacob fell into disuse. By 1974, Jacob had returned to the US Top 100. In 1978, the name broke into the Top 50. And in 1993, Jacob entered the US Top Ten. He’s never left, and spent 1999 through 2012 at #1, joining an elite fraternity of hyper-popular names. In 1974, Jack Nicholson played Jake Gittes in the Oscar-winning Chinatown. The Blues Brothers became a Saturday Night Live skit in 1976 and a movie in 1980. Jake Blues’ full name was Joliet – as in the prison. 1981 young adult novel Jacob Have I Loved was the story of twin sisters, the title taken from the Biblical twins. In 1984’s Sixteen Candles, a young Molly Ringwald has a crush on a handsome senior named Jake Ryan. There’s another heartthrob Jake Ryan on the Disney Channel’s Hannah Montana. In the mid-80s, Jake the Snake became a World Wrestling Federation star. His birth name? Aurelian. One oft-repeated theory that doesn’t hold up: Twilight made Jacob a #1 name. Taylor Lautner was born in 1992, the first Twilight book was published in 2005, and Lautner first appeared on screen as the hottie werewolf in 2008 – all events taking place long after Jacob was a favorite. Today Jacob is perceived as a classic, and given his long history, deservedly so. Jacob fell from the #1 spot in 2013, dropping to #3. 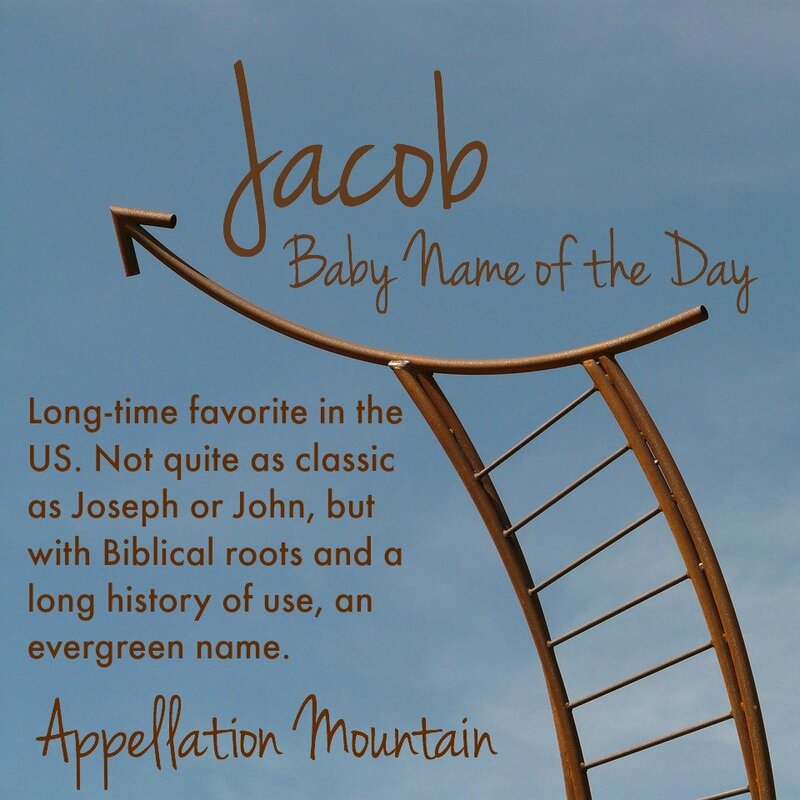 It’s likely that this name will continue to drop, but it will likely be a slow and graceful descent, as many children will still be named after men named Jacob for years to come. What do you think of Jacob? Is this name a modern classic, or a tired trendy name ready for a break? I love Jacobina for a girl! Sadly, unlike her masculine form, has all but died into obscurity. This might seem strange to some people, but because I knew an awful bully named Jacob, I’ve preferred the spelling Jakob ever since. Unless it’s used on a European, where the J is pronounced like a Y, it’s the same name, but the K in place of the C somehow makes it seem nicer to me. I also think the K gives it more originality and personality. I seriously only use the Jakob spelling, even when writing about the Biblical Patriarch (unless of course I’m writing about someone who spells his name with a C). The distinction between Jacob and James in medieval England wasn’t one of religion but rather of language. James or Jamys were vernacular forms, influenced by French Jacomus, Jacme. But all of these people would’ve shown up in Latin records as Jacobus, and by the 16th C when most records were written in the vernacular, you find James and Jacob side by side in the same parish registers.